Pastor Robert Morgan leads a busy life as a pastor and is also a multitasking caregiver to his disabled wife. Most days he feels exhausted, yet over time God has shown him how to build himself up when he s worn himself out. He has learned to fully embrace Psalm 84, as he moves from strength to strength. The valleys and the weaknesses are inevitable. Our task is to embrace these as we wait for God to take us to our next time of strength. 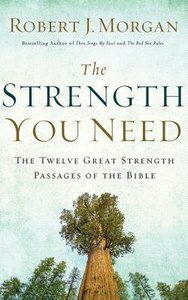 After reviewing the 232 occurrences of the wordstrengthin Scripture, Pastor Robert discovered twelve clear passages that drop anchor in God s Sea of Strength. Among the kinds of strength available to every believer are: Lifelong Strength: your strength will equal your days (Deuteronomy 33:25) Lasting Strength: they go from strength to strength (Psalm 84:5-7) Imparted Strength: the eyes of The Lord range throughout the earth to strengthen those whose hearts are fully committed to Him (2 Chronicles 16:9) Joyful Strength: the joy of The Lord is your strength (Nehemiah 8:10) Timely Strength: God is our refuge and strength (Psalm 46:1) Tranquil Strength: in quietness and trust is your strength (Isaiah 30:15) Renewed Strength: those who hope in the Lord will renew their strength (Isaiah 40:31) Recurring Strength: the Lord will strengthen your frame. You will be like a well-watered garden (Isaiah 58:11) Durable Strength: the Sovereign Lord is my strength; He makes my feet like the feet of a deer, He enables me to tread on the heights (Habakkuk 3:19) Unwavering Strength: Abraham did not waver through unbelief regarding the promise of God, but was strengthened in his faith and gave glory to God (Romans 4:20) Innermost Strength: I pray that out of His glorious riches He may strengthen you with power through His Spirit in your inner being (Ephesians 3:16) Riveting Strength: I can do all this through Him who gives me strength (Philippians 4:13) "
About "The Strength You Need (Unabridged, 5 Cds)"
Robert J. Morgan is a Gold Medallion Award-winning author and has served as pastor of The Donelson Fellowship in Nashville, Tennessee, for nearly thirty years. He holds degrees from Columbia International University (BS), Wheaton Graduate School (MA), and Luther Rice Seminary (M.Div.). His books include Then Sings My Soul (Volumes 1 and 2); Nelson's Annual Preacher's Sourcebook; Nelson's Complete Book of Stories, Illustrations, and Quotes; The Promise; My All in All; and The Red Sea Rules. Rob and his wife have three daughters and nine grandchildren.